Americo Paul “Benny” DiBenedetto was born in Portland, Oregon on August 15 1922, the son of an Italian immigrant and stone mason. DiBenedetto enrolled at the University of Oregon in 1940, intending to pursue a degree in architecture, but suspended his education to serve as a in the U.S. Navy during World War II. After the war, he returned to the university, graduating with a Bachelor of Science degree in Architecture in 1947. Following graduation, he was employed for a short time as a draftsman for the Dorena Construction Co. in Portland before joining the U.S. Army, Corps of Engineers, Portland District working on designs for fish hatcheries, and river and flood control projects. 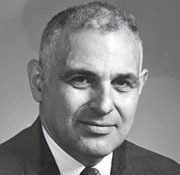 In 1952 DiBenedetto was hired as the Regional Architect for the Pacific Northwest Region (Region 6) of the U.S. Forest Service, based in Portland, Oregon. He served in this position for ten years, before taking the position as architect for the Pacific Northwest Research Station of the Forest Service, also based in Portland. From 1977 to 1979, he also served in a dual capacity as Architect for the Washington Office Research Branch of the Forest Service. After his retirement from the Forest Service in 1979, he co-founded the architectural firm of DiBenedetto and Thomson, Portland, Oregon, and continued to work as a consultant for the Forest Service, as well as the National Park Service. The partnership was expanded in 1986 as DiBenedetto/Thomson/Livingstone Architects, specializing in religious, manufacturing, office, and residential design, and was licensed in seven western states. DiBenedetto remained active in the business until his death in 2008. As Regional Architect for the Forest Service during a period of expansive post WWII growth, he and his team designed numerous ranger stations and ranger residences as well as several Forest Service administrative sites throughout Washington and Oregon during the 1950s and 60s. His team also designed several recreation facilities at ski areas. DiBenedetto is listed as the architect for the majority of Forest Service administrative facilities constructed in the state of Washington in the Post World War II period. During the ten years that Benny DiBenedetto served as Regional Architect for the Forest Service, he developed standard plans for more than 40 different buildings, and 16 site-specific designs. Known project in Washington State include the Forestry Sciences Laboratory (1967) in Olympia; the Forest Hydrology Laboratory (1964) in Wenatchee; Residences at the Wind River Nursery, the Darrington Ranger Station, Red Mountain Lookout , the Skykomish Ranger Station, the Packwood Ranger Station, the Chelachie Prairie Ranger Station, and the Lewis River Ranger Station. DiBenedetto was actively involved in a variety of social and professional organizations including serving as Chairman of the Board of the West Slope Water District in Portland, a consultant to Oregon State University Campus Planning Board, serving on the Executive Board of the Portland Chapter AIA, was an architectural advisor to the Catholic Archdiocese of Portland, and served as an advisor to the Western Wood Products Association. Later in life, DiBenedetto and colleague Vic Kreimeyer launched Oregon Oak Barrel Company to produce Oak Wine Barrels. DiBenedetto passed away in Portland on March 19, 2008.